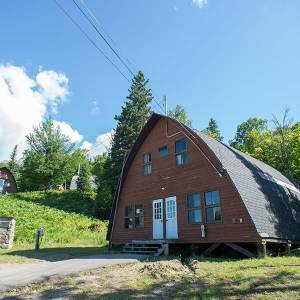 Located about an hour north of Montreal, nature furnishes the site for Camp B’nai Brith, far from the distractions of the city and suburbs, on a green hill and clear lake, amid tall trees and the cool silence of the Laurentian Mountains. 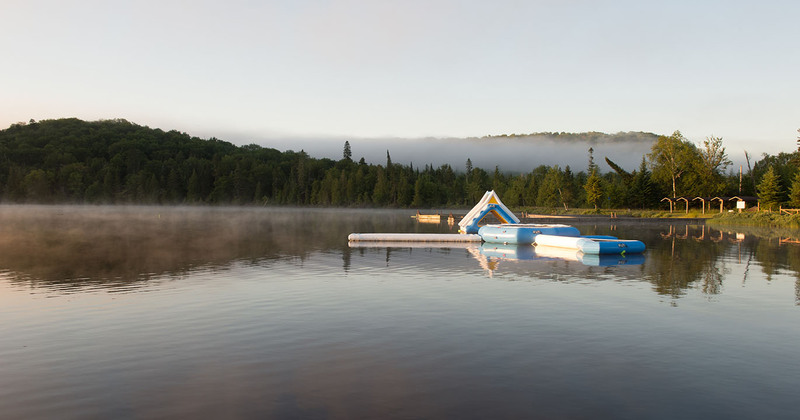 Our goal is to keep all campers safe, secure, and healthy, while providing a clean and care-free environment to play! Our newly renovated Dinning Halls house our campers for 3 meals a day. Both dining halls, separated by our large-scale kosher kitchen, are air conditioned for respite on our hot summer days! The lengths of both halls are lined with large glass garage doors which illuminate meal times and allows us to open them up to create an incredible outdoor camp atmosphere in the dinning hall. Bunks – Each unit consists of: Bunks that fit up to 12 beds comfortably, with a section in the rear of the bunk that rooms 3-4 staff. Junior campers will typically have 8 to 10 campers, while other units could have up to 13. The central hub of every unit is the Rec Hall, where many unit-wide activities take place and within which the Head Staff and a senior staff attached to that specific age group lives. One central washhouse is situated within 30 feet of each bunk. It is well-lit from the inside and out, and very visible even at late hour of the night. The washhouse is separated into two sections; one with individual stall showers and the other with sinks and toilets. In the case of co-ed units, males and females live in separate bunks on opposite sides of the unit, with separate washhouses. Pioneer Tents – The Pioneer Village is a very distinct mainly for the fact that it is the only unit that does not live in bunks. The unit consists of waterproof platform tents that comfortably fit 4 beds. They are all lit and have access to electricity. 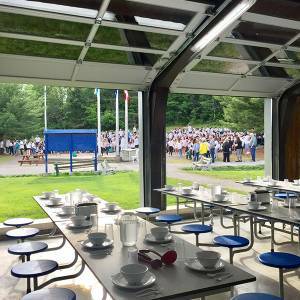 A Rec Hall stands as a central point of the unit next to a kitchen where the Pioneer campers and staff prepare their own meals at points throughout the summer and a dining hall where most breakfasts are eaten throughout the duration of the summer and where other meals take place. The unit also has two washhouses, one for each gender. The washhouse is separated into two sections; one with individual stall showers and the other with sinks and toilets. A state of the art gymnasium (rebuilt in 2015) for sports, circus, gymnastics, and camp-wide events. It also provides a large scale facility for when the rain comes down. A multitude of fields for a wide-range of field games and sports, such as: soccer, football, softball, ultimate Frisbee, etc. A fitness room with spinning bikes, circuit training equipment, weights, yoga mats, etc. 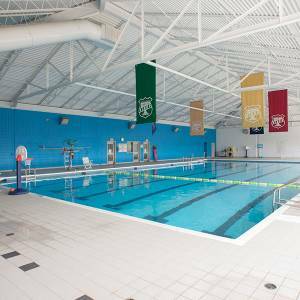 Our half-Olympic indoor heated pool for swim instruction and general swim when the weather is gloomy. Swimming beach for general swim. Our huge water inflatable toy. Boating docks for canoeing, kayaking, paddleboarding, among others. A waterski dock reserved for instructional skiing, wakeboarding, and kneeboarding. Ceramics Studio: with pottery wheels, a kiln, and a wide range of ceramics tools. Media Room: with state of the arts cameras and computers to make movies! 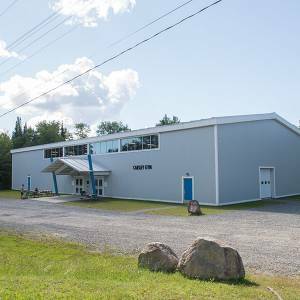 Main Rec: the oldest building in camp houses our drama program and facilitates smaller-scale productions. Kitchen: for cooking and baking – with everything you need to put together a feast! Farm – home to our animals and our animal care activity. Ropes Course / Climbing – climbing walls of various difficulty levels, a high ropes swing, vertical playground, high ropes pamper pole.